Ethiopia through the eyes of children, what is more extraordinary! Share all quiet and unforgettable combination of culture for the largest, nature and varied activities for youngers. Packages for the family, including the historic route of Northern Ethiopia with unforgettable sites Bahirdar, Tana, Lalibela rock-hewn churches and lake, the castles of Gondar and Axum in search of the Ark of the Covenant. 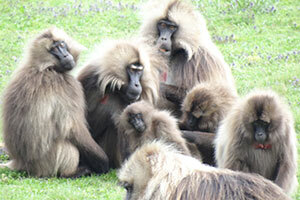 Combined with the national parks to explore wildlife: Oryx, Gelada baboons, zebras, Ibex, multitudes of birds. Rest at the lakes with boat trips to observe the impressive hippos, crocodiles, pelicans. Atmosphere beach, with its water activities (jetsky) horse riding, swiming to Langano, Wondogenet to bath in the hot springs and so much more. Bring your children to discover the tribes of the Omo Valley is also a good option for them to learn about different cultures and traditions.